1. Follow the SALT fan page on Facebook. If you don’t already just click “Like” in the right corner of the page. 2. Briefly tell us (less than 5 sentences) why you want to learn Spanish. We want people passionate about the Spanish culture. Please, be inventive, creative and imaginative. Answers can be funny, bizarre and crazy. We value originality and inventiveness. Don’t worry, you can write in English. You have time until 23.59 on 19th July 2013. – To enter a competition you must be: (a) an Edinburgh resident; and (b) aged 18 years old or over at the time of entry. – Maximum three entries per person. Each person can only win one Beginner 1 course. – The prize is a Beginner 1 course in August 2013. Courses can not be transferable for another levels or different dates. 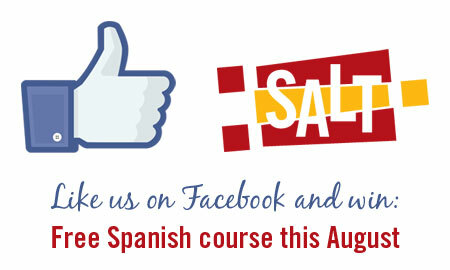 Students are free to choose the Monday & Wednesday course or the Tuesday & Thursday in August 2013. – If you win the competition, we will notify you by e-mail asking your address in order to post the voucher. Make sure that your email address is correct. – By participating in this competition you accept that your email address will be included in SALT’s email list. We will not pass on your details to third parties. – By being SALT student you accept SALT terms & conditions. – Only the person who answers the question can attend the course as a prize. The prize will not be transferable to another person. – Courses are non-refundable for cash. – SALT will endeavour to send the prize within three days after receiving winner’s postal address but cannot guarantee this delivery time. I want to learn Spanish so I can star in the next Amoldovar film. One day my dream will come true and I'll be cast as a drug trafficking, transvestite nun or another typical character. If my acting career fails to take off at least my Spanish will help me when I am on holiday in Malaga. What a great opportunity! I've always wanted to go to Madrid and see the Prado and the Reina Sofia. This would be a great introduction to Espania! I want to live in Spain for a year to try to know it better. I love the openness of the people and the mix of European and Moorish cultures in their food, art and architecture. I want to learn Spanish so that I can live in Valencia and participate in real life there. But learning Spanish opens up a lot more than Spain as Spanish is spoken in so many countries. I don't want to spend my retirement limited to one country or even just one continent. So much to see and do in an unknowable amount of time. I'm with Sheila on this one. I adore the Spanish culture of course but seriously... for the majority of the time I'm at home in the bonny Burgh. I like to combine my natural curiosity in life (read: people watching) with my other love of story telling (read: eavesdropping on other people's conversations). Only today, lying in the park for a quick lunch time power nap and a much needed dose of vitamin D, the quick, feisty and energetic tones of a couple in DEEP conversation lapped over me. They were Spanish, I could recognize that much BUT SALT, if only I could've understood what the drama was about!!! It would have greatly improved my day. Left only with my vivid imagination, I am ashamed to admit I can only eavesdrop in English. How dull. Please help me SALT. I want to speak Spanish because I m planning on taking a long trip to South America next year.I want to spend some time in Sao Paolo, a place I'm fascinated by and knowing Spanish will come in handy. Also, I d like to read Cervantes and to watch Almodovar' s films in their original language. I think it's better to learn a foreign language in a fun, interactive group environment like SALT than taking an online course by yourself. I want to learn Spanish as I'm a stumbling Brit, who can only speak the one language - English. I'd like to alleviate my feelings of inadequacy somewhat. My wife would also like to return to the island of Mallorca and the old town of Pollenca, which she visited lots when younger, and I could flex my new skills to ward off randy Spanish suitors, and really make an impression. I want to understand what Shakira says! Te quiero Rafa! I wanna be your girlfriend! I want to learn spanish because I want to sit on my sofa, eating doritos with salsa sauce while watching (and understanding) those melodramatic and exaggerated spanish telenovelas!